This entry was posted in AFL Outsiders, Injuries, Personnel, Uncategorized on April 3, 2017 by afloutsiders. This entry was posted in AFL Outsiders, Injuries, Transactions on August 24, 2016 by afloutsiders. This entry was posted in AFL Outsiders, Injuries, Personnel, Transactions on August 12, 2016 by afloutsiders. Here is the statbook for Round 1 of the Arena Football League 2016 Playoffs. This entry was posted in AFL Outsiders, Other on August 8, 2016 by afloutsiders. This entry was posted in AFL Outsiders, Injuries, Personnel, Transactions on August 6, 2016 by afloutsiders. Here we are, Playoffs 2016. With that being said, this is the final QB Rankings for 2016 based on the 10 factors that we think make the most valuable signal caller in Arena Football. Our ranking system below captures every QB that threw at least 100 passes that started more than three games (the only exception is Danny Southwick as he was cut after his third start and didn’t start another game the rest of the season). This includes QB Randy Hippeard who was put on Injured Reserve halfway through the year. 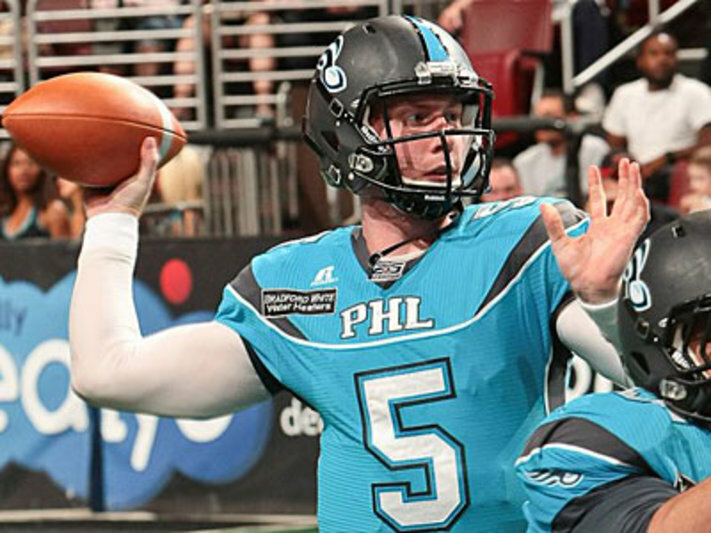 Congratulations to Philadelphia Soul QB Dan Raudabaugh for winning the inaugural AFL FanZone Quarterback of the Year award for 2016. *Remember a 1.0 is a perfect score, 11.0 is dead last. None of these categories are weighted any higher than another as each are important in their own right. The reason our metric system does a TD/INT/SCK to Attempts ratio is because a QB could throw eight touchdowns, but have 50 attempts, that is not as impressive as say six touchdowns with 20 attempts. I call this the Nick Davila stat. Davila lead the league in this stat throwing a touchdown on 21.7% of his attempts. To put this stat into perspective you need to look at Randy Hippeard vs Tommy Grady. Grady threw 29 more touchdowns than Hippeard, but Randy’s ratio is at 18.06% vs Grady’s 16.01%. That means Hippeard threw more touchdown’s per attempt than Grady did, which is very impressive. Just remember, this metric stat is based on stats and is ranked on a curve. This does not necessarily say that Bernard Morris is a better quarterback than Tommy Grady, but that Morris was more efficient THIS season. This entry was posted in AFL Outsiders, Personnel on August 3, 2016 by afloutsiders.